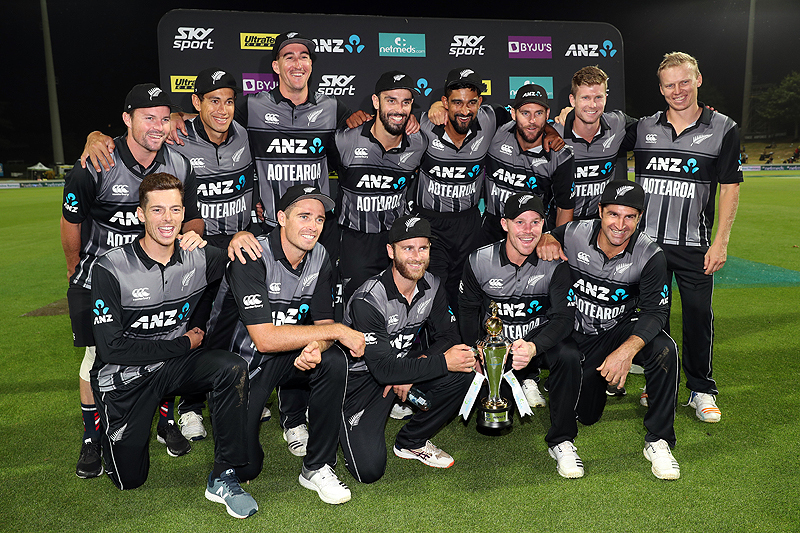 HAMILTON: Colin Munro’s explosive 72 set up a four-run win for New Zealand over India in a cliff-hanger finish to yesterday’s Twenty20 match in Hamilton, handing the hosts a 2-1 series victory. India looked to be on the ropes when they needed 47 off the last three overs. But Dinesh Karthik and Krunal Pandya together plundered 32 off overs 18 and 19 before Tim Southee restricted the duo to 11 in the 20th. “It was obviously touch-and-go there for us,” said Munro whose whirlwind knock at the start of the match laid the platform for New Zealand’s 212 for four with India 208 for six at the close. The morale-boosting victory for New Zealand gave captain Kane Williamson something to smile about after they were whipped 4-1 by India in the earlier one-day international series. “It came down to the last couple of balls and it’s nice to come out on the right side,” he said. It was a more sombre mood in the India dressing after Rohit Sharma had won the toss and defied convention by not batting first in a series decider, saying his team preferred to chase regardless. “It was pretty disappointing to not get over that finishing line but I thought we fought really well till the end,” he said. “We started off really well with the ODI series and we wanted to do well here with the T20.” It was a vital knock from Munro, whose position in the New Zealand side ahead of the World Cup had been in question after a string of failures in the ODI and Twenty20 matches against India. The pair raced to 80 in the eighth over when the lightning hands of MS Dhoni had Seifert stumped by a hair’s breadth for 43. Munro’s belligerence saw him face just 40 balls in his innings, flaying the bowling with five fours and five sixes. He was removed by Kuldeep Yadav when he skied a ball to Hardik Pandya running in from long-on. Vijay Shankar took an equally aggressive stance at the start of India’s chase and the visitors were up at the required run rate through the first half of their innings, but were unable to establish partnerships. Rishabh Pant belted a four and two sixes with his first three scoring shots and raced to 28 off 12 before he became debutant Blair Tickner’s first victim, swiping at a full toss that was caught at mid-wicket.